The Red Hot Chili Peppers were the featured guests on the latest edition of “Carpool Karaoke” on CBS-TV’s The Late Late Show with James Corden. 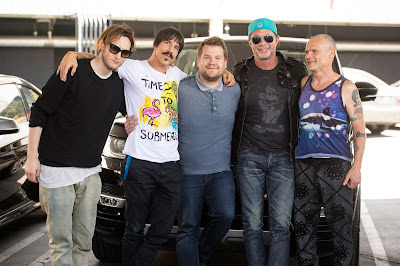 Anthony Kiedis, Flea, Chad Smith and Josh Klinghoffer helped Corden get to work via the carpool lane during an action-packed episode that saw the group share stories, sing-along with their own tunes and even take the host on in a spontaneous wrestling match. The music mix delivered Peppers classics like "Give It Away," "Under The Bridge," "Californication” and “By The Way” as well as “Dark Necessities”, the lead single from the group’s new album “The Getaway”, which will be released on June 17. "I never expected this to be as fun as it has been,” said Corden. “People say 'don't meet your heroes,' but I don't think they've ever met the Red Hot Chili Peppers." Produced by Danger Mouse, “The Getaway” marks the Los Angeles group’s first album in five years.